As the World Cup, one of the most renowned competitions across all of sport, draws ever closer, the debate is beginning to heat up over who will outlast the other 31 nations to lift the Jules Rimet trophy this summer. With many sports-book offering some of the best markets available on outright World Cup winner betting, it is imperative you back the right team this summer. With that in mind, all factors should be considered when making the decision over which side you believe will be crowned World Champions this summer, including the weather. 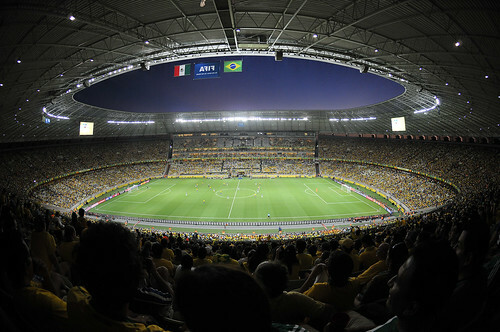 The tropical temperatures and differences in climate South America enjoy will be an eye-opening experience for many of the nations, with evidence for this coming in Spain’s Confederations Cup campaign. The Spaniards looked off the pace at times and struggled to maintain their fast paced passing style in the later fixtures of the competition. It took a penalty shootout to eliminate Italy in the semi-finals, before they crumbled in front of a powerful host nation in Brazil at the Maracana. The home advantage definitely aided a confident young Brazilian side, and that will be no different this summer either, but Spain looked visibly worn out due to the intense heat surrounding them. If Spain suffered burnout in 2013, where they only played five games, then you would expect them to suffer the same lapses in tempo around the quarter final mark of the World Cup, which would be a great under achievement for Vicente Del Bosque’s men. The conflicting arguments are there in the fact the Confederations Cup is a lesser regarded tournament than the World Cup, but Spain will have no doubt wanted to compound their dominance over rival nation Brazil before heading back to the samba shores in 2014, and we cannot forget that fellow European side Italy also struggled during the tournament. Their youthful and exuberant strike force were a joy to watch, but their defence, long-known for its resiliency and efficiency in stopping goal-threats, conceded ten goals, averaging at two a game. A repeat of those statistics this summer and we will likely see the Italians flying home from Brazil early. Spain and Italy are two of Europe’s greater forces when it comes to international football and if they suffered under the heat, then it will surely be a worry for the likes of England and France. While other European nations such as Germany and Belgium have relatively young squads who are likely to be able to cope with the demands of the temperatures, veteran player such as Steven Gerrard and Patrice Evra are a lot less likely to be able to boast the same kind of efficiency. If you are looking to back anyone to win the World Cup this summer, be sure to consider the climate of host nation Brazil as a major factor. A safe bet would be Brazil themselves, after they defeated Spain 3-0 in the Confederations Cup final and have come on leaps and bounds since. They are priced at 14/5 with 32Red in the Sports betting section and should they replicate the form showed last year in international football, they could be a shrewd bet to be crowned World Champions this summer.